- GREETINGS FROM THE COAST GUARD CUTTER POLAR SEA! - Teachers.Net Gazette - STRESS RELIEF, STUDENT MOTIVATION, ORGANIZATION IDEAS, CLASSROOM MANAGEMENT, LESSON PLANS, DISCIPLINE, AND MORE - featuring columns and articles by top names in education and your teacher colleagues around the world! The Teachers.Net Gazette is a clearinghouse for teacher writing, from well-reasoned education essays to teacher prose, poems and humor! Bookmark the Teachers.Net Gazette and tell a friend! Please note the change for any future email correspondence. Now, on with the update! On October 28th, two Dolphin helicopters and the flight crew departed Mobile, Alabama for Seattle, Washington to meet the ship at the pier. Although we were hampered by severe weather and a few maintenance concerns, we arrived safely after 5 days of flying!! Our route made for a very scenic tour of the southern and western United States. On the first day, horrible thunderstorms spawned by a hurricane that hit Mexico forced us to land in a very small town in central Mississippi. From there, we were only able to get as far as Vicksburg, Mississippi before we ran out of daylight and good weather. The next morning, we flew out of the last of the rain showers and refueled at Tyler, Texas. From there, it was a straight shot to Abilene, Texas. At Abilene, the helicopters started to show signs of problems, but we were able to fix them and we headed out for Roswell, New Mexico. Have you ever heard of Roswell? It was made famous in the 1960's because some people there were sure that the government was conducting secret experiments on aliens at a restricted site known as Area 51. Although we did not see any aliens there, I am sure they saw us because the helicopters broke down when we arrived. Hmmm, coincidence? The next morning, a Coast Guard HU-25 Falcon jet delivered some parts to us in Roswell, and by noon we were able to fly. We made a fuel stop in Albuquerque, New Mexico and called it a night in Sedona, Arizona. After a good night's sleep, we were greeted by the most beautiful sunrise that reflected brilliantly off of the red rock formations that surround Sedona. We could only bask in the glow of Sedona for a brief moment as there were many miles left to fly! Our first stop of the day was going to be Las Vegas, Nevada. As we approached Las Vegas, we were treated to the sight of the Grand Canyon and Hoover Dam. The Canyon is breathtaking from the air. 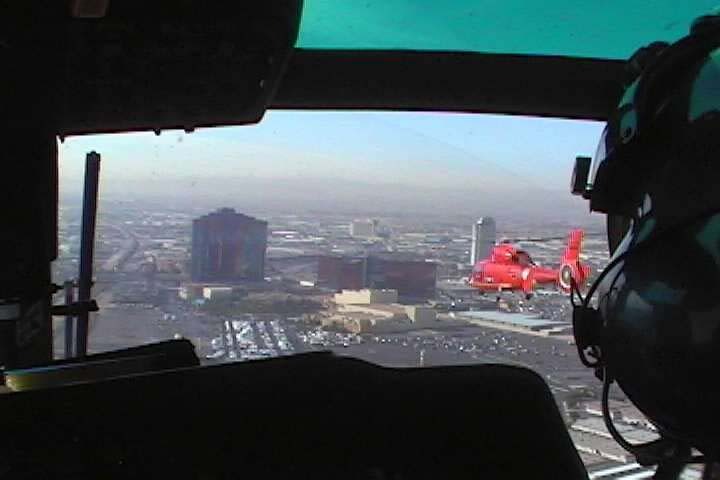 Unfortunately, there was no time to partake of the games in Las Vegas, so we refueled and headed out for the most challenging portion of the flight for the helicopters. For those of you studying physics and aerodynamics, helicopters do not do as well at high altitudes as they do at lower altitudes. As you already know, the higher you go, the thinner the air. Imagine taking a paddle from a canoe and sweeping it through the air. Probably won't get very far like that. Now sweep it through the water, which is obviously more dense and thicker than air. The paddle gets a good "bite" of the water and you go forward. It's the same with a helicopter. The rotor blades are our "paddles" and they sweep through the air trying to get a good "bite". The thinner the air is, the harder the blades have to work to move the helicopter. Leaving Las Vegas, we would have to traverse the Sierra Nevada mountains. This meant we would have to climb to nearly 13,000 feet, no small feat in a helicopter loaded with people and gear. Fortunately, the weather was cooperative and we had a breathtaking view of Death Valley and the Sierra Nevada mountains. It was time for lunch and a refuel so we stopped in Fresno, California for both. After a quick bite to eat, we set sail for our destination for the night, Redding, California. Only one day left of flying! In the morning, both helicopters left Redding for the final two legs of our cross-country journey. The first leg would take us over Sacramento, California to Eugene, Oregon. In Eugene, the temperature was quite cool compared to what we left behind in Alabama. Better get used to that! The last leg of our long trip took us over Portland, Oregon, across the Columbia River, and by Mount Saint Helens and Mount Rainier. We finally descended into Boeing Field, downtown Seattle and stretched our weary legs. It had been a long trip. We grabbed our gear and headed for the Coast Guard Cutter POLAR SEA. In only a couple of days, we would fly the helicopters aboard and set sail for the Pacific. On November 4th, the POLAR SEA left the pier and embarked the two helicopters. We exited the Straits of Juan de Fuca which separate Washington State from Vancouver Island in Canada and proceeded for the open ocean. Little did we know what was in store for us. A very large Typhoon had been churning the northern Pacific Ocean into a boiling cauldron. For the next 5 days, the POLAR SEA was buffeted by 30-foot seas and 60 knot winds. Because the POLAR SEA is an icebreaker, her hull is uniquely designed. Instead of a wedge-shape with an angular hull, the POLAR SEA is shaped more like a football so that she can ride up on top of the ice and crush it with her weight. This is wonderful for breaking ice, but not so good for heavy seas. Imagine how easily a football rolls if you toss it in the pool. That's how badly we rolled in those heavy seas. To answer everyone's questions, I was as green as the little Martians supposedly in Roswell, New Mexico. Finally, after nearly a week of being pummeled, the seas laid down and the winds subsided. It was time to pull into Honolulu, Hawaii for some repairs and training. As we pulled in to Honolulu, one of our helicopters flew off to land at a Coast Guard Air Station outside of Honolulu called Barbers Point. While the ship was in port, we would use the opportunity to get some flying in and work on the aircraft at a Coast Guard hangar. On one of these flights, I saw the most spectacular sight. We were fortunate enough to be able to see many of the islands on a day-long flight. As you know, Hawaii has many islands. Honolulu is on the island of Oahu. Honolulu is also famous for Pearl Harbor, the Navy base that was attacked by the Japanese on December 7th, 1941 and caused the United States to become involved in World War II. To the east is Molokai, Maui, and the "Big Island" of Hawaii. We were able to fly across the northern shores of these islands and refueled at Hilo on the island of Hawaii. Do you know what else is on the "Big Island"? Hawaii is one of the only places in the world you can go and see a volcano erupting. One of the most famous is Kilauea. Kilauea has been constantly erupting for many years, spilling molten lava out of its crater and through underground lava tubes. The lava flows down the mountain and into the ocean causing enormous amounts of steam. We were fortunate to be able to fly right over the volcano and see the lava boiling in the cauldron that the locals call the "Jacuzzi." It was an amazing sight. The next day, I paid a visit to the USS ARIZONA Memorial in Pearl Harbor. The ARIZONA was one of the great battleships that was the backbone of the US Navy. When the Japanese attacked, a 1,200-pound bomb dropped by a high-altitude bomber hit the ARIZONA. That bomb just happened to hit the magazine where all of the ammunition for the gigantic guns were kept as well as the aviation fuel tanks. The ensuing explosion rocked everything within miles and over one thousand people lost their lives in an instant. After a few days in Honolulu, the POLAR SEA is underway again and headed southwest. Barring additional technical issues with satellite connectivity, you should receive your next update by next Monday. I hope all of you enjoy the updates and we look forward to hearing from you. Please remember that there are nearly 13,000 students reading these so we might not be able to respond to all of you. But we will do our best! Fortunately, several members of the POLAR SEA's crew have offered to help as well. To all of you, have a great week and try to look at a map to see the trail of where we have been so far. Take care. Happy Thanksgiving from the Pacific Ocean! Thank you to all of the classes who have written with questions! There are several members of the ships crew as well as the Aviation Detachment that have volunteered to assist in answering questions so all schools are invited to send their questions. Questions will be answered as quickly as possible so if it takes a little time, please be patient. The weather has been much nicer since we left Hawaii. It is definitely getting a lot warmer as we head towards the equator. Crossing the equator has a lot of significance for sailors. Crossing the International Dateline has similar significance. To seafarers, those who have never crossed the Equator or dateline are called "Pollywogs" (right now I'm still a Pollywog). Those who have crossed the Equator are called "Shellbacks" and those who have crossed the Dateline are called "Golden Dragons." There are a lucky few who have crossed the exact place where the Dateline and the Equator cross. These few are called "Golden Shellbacks." There is an initiation of sorts for all Pollywogs who wish to earn the title of Golden Shellback if we are fortunate to cross that point. If it happens, I'll let you know what I had to do. Could be interesting, but it is all done in good clean fun. I have had several requests for pictures so I have added some below. 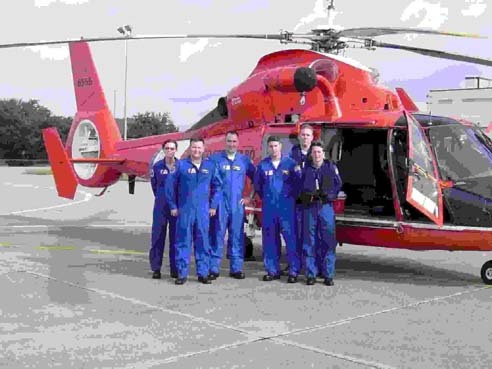 The first picture is a picture of the crew that flew across the country. I am the third from the left. In order of left to right, the crew is Catie Pawlo, Mike Dean, myself, Neil Wilson, Travis Perryman, and Kelly Larson. 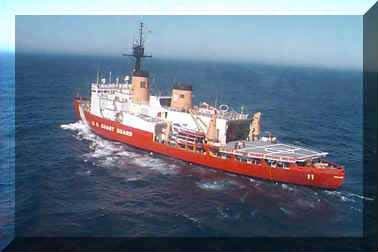 The next picture is a picture of our ship, the POLAR SEA. The third picture was taken from inside one helicopter looking at the other as we flew over Las Vegas. 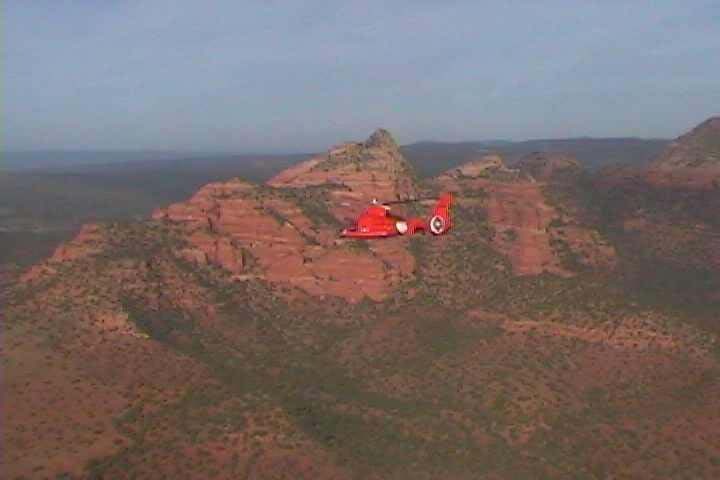 The last picture is of one of our helicopters flying by the red rock formations in Sedona, Arizona. As promised, here are a few more pictures to give you a feel for the trip so far. 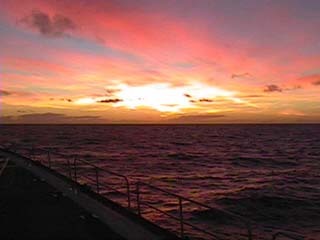 The first picture is a great illustration of what sunsets are like far out at sea. They take your breath away. 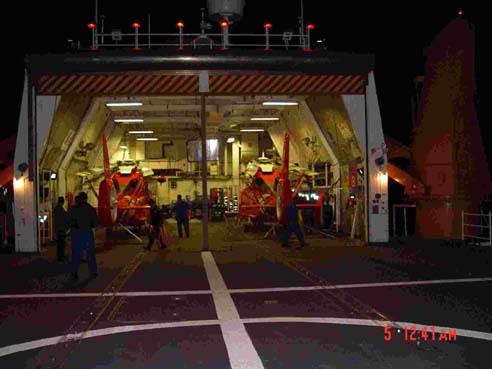 The next picture is of our two helicopters tucked into the hangar of POLAR SEA at night. You might be able to see that all of the rotor blades are folded back towards the tail so that they both fit. Here are the final two pictures. I can only send a couple at a time because of bandwidth issues and the satellite. I am working on getting that corrected if possible. 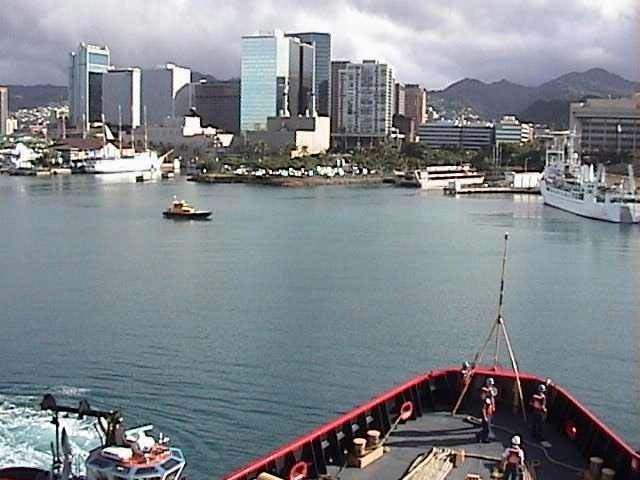 The first picture is of our arrival in Honolulu, Hawaii from the Flying Bridge. That is the area above the pilot house where the lookouts are usually posted. 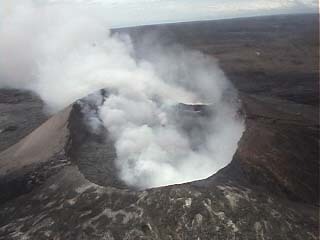 The final picture is one I took as we flew over the crater of the volcano Kilauea. That was an amazing experience to see lava flowing into the ocean. I hope that you all have a safe and Happy Thanksgiving. I look forward to your email!